Let me preface this by stating that I am a huge fan of baseball and of the book, Moneyball. It helps to be a fan of both, but the film adaptation was created in a way to appeal to everyone. 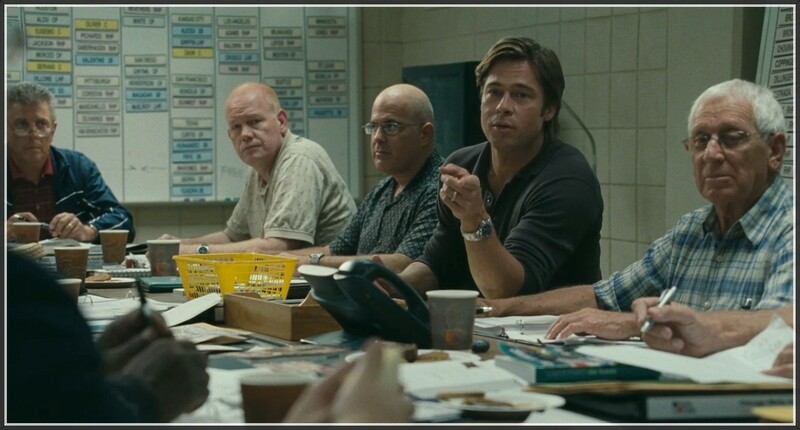 The movie, just like the book, focuses on the true story of the 2002 Oakland Athletics and their charismatic general manager, Billy Beane (Brad Pitt). A former baseball player who moved to the front office after he didn’t “pan out”, Beane is responsible for operating a small-budget Major League Baseball team. Oakland’s total team payroll in 2002? A paltry $39 million, the third lowest in all of baseball. Compare this to the mighty Yankees, who had a whopping $125 million payroll that year. Yet the year before, in 2001, the A’s won seven more games than the Yankees and ended up meeting them in the playoffs. While the team wildly exceeded its expectations, this was still a grave disappointment for the demanding Beane. He was faced with an even greater dilemma that offseason in that three of his best players — Jason Giambi, Johnny Damon and Jason Isringhausen — were all leaving via free agency because he couldn’t afford to pay them. Now, not only does he have to follow up a tremendous 2001 season but he has to do it with spare parts in the roles of his former superstars. This is where “Moneyball” steps in. After persuading a rival team’s assistant named Peter Brand (Jonah Hill) to join Oakland, the two collaborate and develop a new way to look at baseball. Instead of listening to gray-haired scouts rattle on about a player having all “five tools” or how good they look in appearance, Beane and Brand decide to focus on sabermetrics and non-traditional statistics. They seek players who can get on base by any means necessary, particularly by drawing walks. Their key stat? On-base percentage. Who cares if a guy is a liability in the field if he makes up for it with his bat? That’s the perception the two executives have, and it is perhaps best illustrated in the form of one player: Scott Hatteberg. “Hatty”, as he was commonly known (played by Parks & Recreation’s Chris Pratt), is the perfect example of the Moneyball theory. Unwanted by other teams since nerve damage no longer allowed him to play catcher, Hatty is visited by Beane in an attempt to get him to play first base. Even though he is terrified of taking ground balls at the position, he perseveres and puts together some great moments at the plate (including an epic at-bat during the team’s record-breaking 20 game winning streak). Hatteberg’s salary in 2002 was $900,000. Giambi’s? $10.4 million. It’s pretty freaking incredible that a team patched together with past-their-prime veterans (like David Justice) and defensive liabilities (Hatteberg) could still manage to win over 100 games and make the playoffs once again. It doesn’t matter that the team lost in the first round again — they still went toe-to-toe against teams with payrolls four times as large. 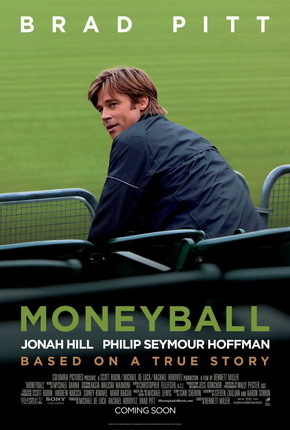 Plus the concept of Moneyball revolutionized the league, and its effects are still felt today. In terms of a film watching experience, you do not need to be a baseball fan to enjoy the movie (as stated above). Brad Pitt gives Beane a highly likable personality, even as we see how he is a deeply flawed man. Jonah Hill is quiet and subdued as Peter Brand, and it’s interesting to see him take on a role like this. The always excellent Philip Seymour Hoffman plays A’s manager Art Howe, who frequently butts heads with Beane due to differences in baseball philosophy. Chris Pratt also does well with his role of Hatteberg, astutely playing a baseball player who lacks confidence in himself. The script is both well-written and intelligent, and it also has a surprising amount of humor. Screenwriters Aaron Sorkin and Steven Zaillian did a fantastic job adapting Michael Lewis’ bestseller. As far as baseball movies go, this is one of the best. As far as 2011’s movies go, this is also one of the best. Everyone will find something to like about Moneyball, whether it’s the smart dialogue, perfect cast or the baseball philosophy. Such a great film. Glad you enjoyed it as well. Indeed. Possibly my favorite so far this year, although I have missed out on a few. Very good to see you liked this one. I want to see it, and have high hopes for it. I think it’s an incredible story, too. I’m a brad Pitt fan, so that’s a plus in my book too. It’s good to hear that everyone played their roles well, too. Good review, thanks! 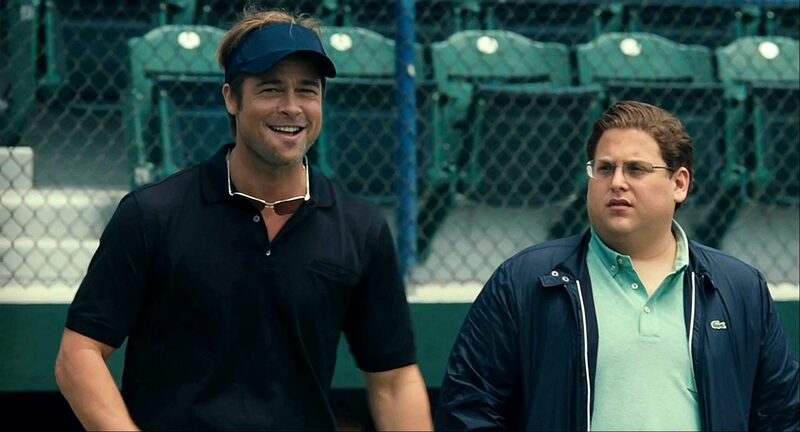 Yeah, it’s great, especially if you are a fan of baseball (or Brad Pitt). It has a kind of Social Network vibe going for it, too, if you liked that movie. Solid movie although I didn’t feel it was truly great. IMO Brad Pitt was perfectly competent but yet, not really all that impressive that he would warrant an Oscar nod down the road. The movie does gloss over some facts such as the A’s having 3 excellent pitchers in Mulder, Hudson and Zito who were the centerpiece of this early 2000’s teams. Eh, I don’t think the movie needed to bring up the A’s starting pitchers. They were only glossed over in the book, and they were ultimately less important to the overall concept and ideology of Moneyball. It’s most impressive that Beane and “Brand” were able to find more-than-competent replacements for some of their big name players, all at a very low cost. But yeah, I agree about Brad Pitt’s performance. He was great, but I don’t know if an Oscar nod is deserved. It may not feel quite like the classic baseball movie others have achieved, but it’s certainly pleasant enough to be enjoyable even by non-sports fan, and features great performances from Hill and Pitt. Good review Eric. Thanks Dan. I was most pleased that the movie remained faithful to the book, yet was able to appeal to a larger audience as well. I was scared the movie would talk down to me because of all the statistics involved, but it didn’t. I was very pleased. Yeah, I think it’s great that the movie is able to appeal to a wider audience rather than just baseball fanatics and stat geeks (like myself). Glad you enjoyed it. Good deal, you’ll have to let me know what you think of it!